Rafters connect to a stud wall's top plates by a direct nailing method called "toenailing." Toe-nailing simply refers to driving nails through the rafters' sides at angle to ensure that nails' shafts penetrate through both the rafters and plates. However, because toenailed fasteners cannot resist forces from all directions, most municipalities require builders to install metal straps, called hurricane ties, which connect the inside edge of the wall's plate to the side of the rafter. Rafters and trusses rest on top of wall plates and connect to wall framing by direct nailing and metal straps. Hoist the rafter on top of the wall framing. Tilt the rafter on edge. Lift the rafter and position the rafter's notched end, called a "bird's mouth," in position over the wall's plate and the opposite end in position against the roof's ridge board. Align the opposite ends of the rafter with layout marks; usually 16 inches on center for rafters. If ridge ties connect your rafter to the ridge board, position the rafter in the hanger's saddle. Hold a level against the side of the rafter, near the rafter's connection to the ridge board. Adjust the rafter's vertical position or "plumb." Use a framing nail gun to toenail the rafter to the ridge board or, if using a ridge tie, use a hammer to drive hanger nails through the sides of the bracket and into the rafter. Move to the bird's mouth end of the rafter and align the rafter with the layout lines on the wall's top plate. Use the nail gun to toenail the rafter to the top plate on one side. Move to the opposite side of the rafter and apply a second toenail. Hold a hurricane tie against the face of the rafter and align the bottom side of the tie against the inside edge of the wall's plate. While holding the hurricane tie in position, use a framing hammer to drive joist hanger nails through the hurricane tie's nail holes and into the plate's edge and rafter's face. There are several types of hurricane ties and plate to rafter connectors. Whereas some municipalities allow rafter face to plate edge connectors, municipalities in high wind areas often require connectors that strap across both the rafter's face and top edge. To avoid ridge to rafter connections, consider ordering roof trusses. 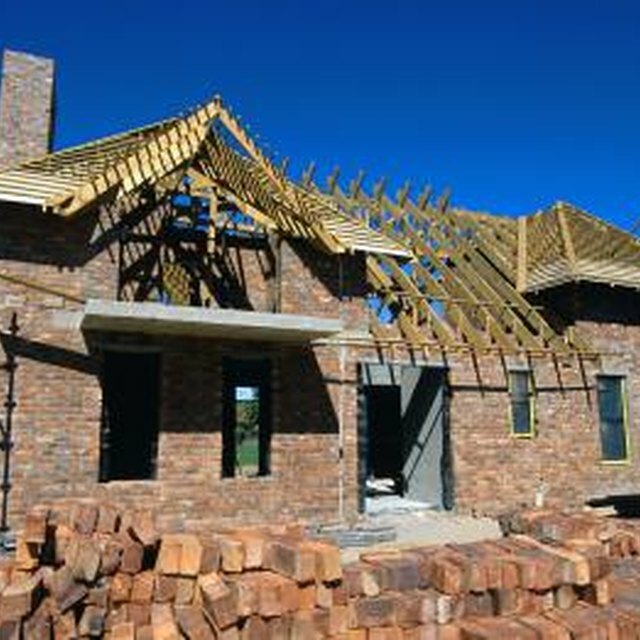 Typically triangular, roof trusses are pre-assembled roof framing units that consist of a rafter, internal webbing and bottom joist. Building codes often require straps or ties across rafter to ridge connections; consult local building authorities for requirements. Alternatively, codes might require carpenters to install collar ties or collar beams that run between corresponding rafters.